Pierre Marcel Poilievre PC MP (born June 3, 1979) is a Canadian politician who served as Minister of State for Democratic Reform from 2013 to 2015 and Minister of Employment and Social Development in 2015. He is currently a Member of the Parliament of Canada representing the suburban Ottawa riding of Carleton as well as the Opposition Critic for Finance and National Capital Commission (also referred to as Shadow Minister of Finance) of the Conservative Party of Canada since 2017. 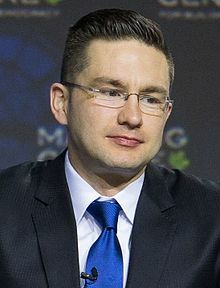 First elected to the House of Commons in 2004 in the riding of Nepean—Carleton, Poilievre was reelected in 2006, 2008 and 2011; he was elected in 2015 in the reestablished riding of Carleton. Poilievre was born in Calgary, Alberta, the son of schoolteachers. Poilievre is Franco-Albertan in origin. He studied international relations at the University of Calgary, following a period of study in commerce at the same institution. He holds a Bachelor of Arts degree from the University of Calgary. Poilievre has done policy work for Canadian Alliance MPs Stockwell Day and Jason Kenney, and prior to running for office himself; worked as a full-time assistant to Day. He also worked for Magna International, focusing on communications, and has done public relations work. In 1999, writing as Pierre Marcel Poilievre, he contributed an essay, "Building Canada Through Freedom" to the book @Stake—"As Prime Minister, I Would...", a collection of essays from Magna International's "As Prime Minister" awards program. In his essay he argued, among other things, for a two-term limit for all Members of Parliament. He did not win the competition and is now in his fifth term as an MP. At the time, he was editorially described as being in the second year of a Commerce program at the University of Calgary. His self-description was as "a political junkie with a passion for public debating and a special interest in international relations". In 2004, Poilievre stood as Conservative candidate in the riding of Nepean—Carleton. He defeated Liberal cabinet minister David Pratt by 3,736 votes. In 2006, Poilievre was re-elected with 55% of the vote, beating Liberal candidate Michael Gaffney by 19,401 votes. He has been re-elected in 2008 and 2011 with similar majorities. Since 2006, he has been appointed as Parliamentary Secretary to various ministers including John Baird, the President of the Treasury Board and to Prime Minister Stephen Harper. As Parliamentary Secretary to Treasury Board, Poilievre took credit for redrafting Canada’s whistleblower protection laws. and worked with Minister John Baird to pass the Federal Accountability Act through the House of Commons of Canada. The Public Servants Disclosure Protection Act was enacted to provide a process for public sector employees when disclosing abuses and wrongdoings within the federal government and protection of these employees from reprisals. The Federal Accountability Act received Royal Assent on December 12, 2006. In the summer of 2006, Poilievre and Minister John Baird helped secure a $1 per year rent for the Queensway Carleton Hospital from the National Capital Commission. Before the brokered agreement, the QCH was paying the NCC $23,000 per year in rent. The lease of the hospital was to expire in 2013, and the rent was set to increase substantially. Poilievre advocated for the construction of the Strandherd-Armstrong bridge which spans the Rideau river. The eight-lane bridge links Riverside South with Barrhaven Poilievre secured one-third of the project's funding and acquired the neighbouring airport land needed to complete the Limebank Road expansion, tapping into funds already committed by former MP David Pratt for transportation projects in this riding. Construction began on July 27, 2010. The event was locally publicised, with politicians of all levels and parties involved attending the ground breaking. The bridge was originally scheduled to be completed in 2012, but in 2012 the original contractor, ConCreate USL, went into receivership. The bridge opened in July 2014. As a member of Parliament, Poilievre has been involved with a variety of charities. For his 30th birthday, Poilievre co-hosted an event with Ottawa Police Chief Vernon White to help raise funds for Harvest House Ministries and Project S.T.E.P. Both charities do work within the greater Ottawa community to treat substance abuse and prevent addiction. Poilievre has also secured $1 million in funding for the city of Ottawa's drug treatment initiative. In 2005, Poilievre helped raise $40,000 to help rebuild the Manotick legion after it was destroyed by fire in June of that year. On February 13, 2009, Poilievre stood in the House of Commons to make a statement concerning incidents of alleged anti-Semitism at York University. Poilievre stated his belief that Canadians must address anti-Semitism on college and university campuses. "Mr. Speaker, our Conservative government condemns the latest anti-Semitic outburst at York University. This week, chants of 'Zionism is racism' were heard, and one person was called a 'dirty Jew'. Sadly, incidents like these have become far too prevalent on college and university campuses across Canada. I am reminded of the violent left-wing mob that shouted anti-Semitic curses at a former Israeli prime minister and prevented him from speaking at Concordia University in 2002. I fear there is a rise among the extreme left of a new anti-Semitism. We see it in the instances that I mentioned. It lies below the surface of the public discourse waiting, waiting for us to let our guard down, waiting for the outrage to subside, waiting for the right time to flourish. We must confront it, fight it, and defeat it." Poilievre was sent by Prime Minister Stephen Harper to Geneva, Switzerland in April 2009 to attend the Conference Against Racism, Discrimination, and Persecution. This conference was held at the same time as the Durban Review Conference, which had been criticized by the Prime Minister as full of "anti-Semitic rhetoric". During the same trip, Poilievre traveled to Poland to participate in the International March of the Living Mission, a tour of Nazi concentration camps to commemorate the memory of the victims of the Holocaust. Poilievre is opposed to a national carbon tax. In May 2009 Poilievre was accused of having insensitively used the term "tar baby" in the House of Commons in reference to a policy of carbon taxation from which Poilievre suggested that Liberal leader Michael Ignatieff would try to distance himself. Poilievre repeated the term later in the same question period. A number of opposition MPs demanded Poilievre make amends for the use of the term. Poilievre argued that he did not know that the term had racist undertones and was using the term in the sense of its common definition as a sticky and hard to handle issue. Over the previous years, the term itself had been used by a number of prominent Canadian public figures to indicate a sticky situation. Following the 2011 election, Poilievre was appointed Parliamentary Secretary to the Minister of Transport, Infrastructure and Communities and for the Federal Economic Development Agency for Southern Ontario. On July 15, 2013, Pierre Poilievre was appointed to Cabinet by Prime Minister Stephen Harper as Minister of state for democratic reform after a recent Cabinet shuffle. Poilievre has also supported Conservative MP Russ Hiebert's private members bill C-377, An Act to Amend the Income Tax Act (labour organizations). The legislation advocates for an increased schedule and scope of disclosure for every Canadian labour union. Poilievre introduced Bill C-23, known as the Fair Elections Act, into the House of Commons on February 4, 2014. The bill expanded the types of ID which were accepted in order to vote, and eliminated the vouching system, whereby a voter can vote without an ID and have an acquaintance 'vouch' for them. The bill was opposed by former Chief Electoral Officer Jean-Pierre Kingsley, former Auditor General Sheila Fraser, and dozens of Canadian and international political experts — Poilievre stepped up his attacks on Marc Mayrand, the Chief Electoral Officer of Elections Canada at the time, by accusing him of wanting "more power, a bigger budget and less accountability." In the same appearance before the Senate Standing Committee on Legal and Constitutional Affairs, Poilievre went on to accuse Mayrand of "fighting to retain this power, making some incredible claims and inventing some novel legal principles to do it." The bill was passed and has received royal assent. On 22 October 2014, Poilievre was present at Parliament Hill during the attack on the House of Commons by Michael Zehaf-Bibeau. He, along with the Prime Minister and many other MPs, barricaded themselves in the Conservative Caucus meeting room. He was one of a number of MPs who broke down flag poles and fashioned them into spears to ward off the assailant should he force his way inside. Later, when he and fellow Conservative ministers and MPs met at the Foreign Office, Poilievre brought along his spear as a memento. Poilievre was re-elected in the newly re-drawn riding of Carleton in 2015, although his margin ahead of the Liberal candidate was closer than in previous elections, at less than 2000 votes. He was the only Conservative MP elected in the Ottawa area. In early 2016, Colin Jayantha Perera, a constituent of Poilievre's who had end-stage kidney failure, had arranged for his nephew, a matching donor, to visit Canada from Sri Lanka to donate him a kidney. However, the visitor visa of Perera's nephew was denied. Perera then approached Poilievre, who then asked then-Immigration Minister, John McCallum, for a rarely-granted minister’s permit to let the nephew visit for the operation, which was granted. On July 4, 2017, Poilievre entered into a Compliance Agreement with the Commissioner of Canada Elections, for failing to comply with the Canada Elections Act by "knowingly circumvent the prohibition on contributions to a registered party by ineligible contributors." Conservative Party Leader Andrew Scheer named Poilievre the party's Finance Critic as part of its shadow cabinet. ^ a b "A full list of the new and old faces in Stephen Harper's cabinet". The Globe and Mail. Toronto. 15 October 2013. ^ Parliamentary biography of Pierre Poilievre Archived 2010-09-09 at the Wayback Machine; www.pm.gc.ca. ^ "bio". Archived from the original on 2013-12-25. ^ "Prime Minister Harper makes changes to federal portfolios". ^ @Stake—"As Prime Minister, I Would...". Magna International Inc., 1999, p. 57. ^ "Tories consider U.S.-style bounty for waste-busting whistleblowers". Archived from the original on 2007-06-12. ^ "Children's Fitness Tax Credit". Archived from the original on 2007-10-11. Retrieved 2009-07-17. ^ Ottawa Citizen (July 29, 2006). "Queensway hospital gets break on rent". Ottawa Citizen. Archived from the original on 2007-10-11. ^ CBC Ottawa (July 31, 2006). "Queensway hospital gets break on rent". CBC. Retrieved 2015-05-29. ^ "Strandherd-Armstrong Bridge – Project Overview". ^ "Poilievre victorious in Nepean-Carleton". Ottawa Citizen. October 15, 2008. Archived from the original on 2012-11-06. ^ "Detailed overview of the Strandherd-Armstrong Bridge project". City of Ottawa. Archived from the original on 2014-03-10. ^ "Strandherd-Armstrong bridge work to resume". CBC News. 6 June 2012. Retrieved 11 May 2018. ^ "Project S.T.E.P." Archived from the original on 2011-07-06. ^ "Manotick Directory: Royal Canadian Legion of Manotick, South Carleton Branch 314". Archived from the original on 2012-08-04. ^ CTV.ca News Staff. "Tory MP says sorry to natives for 'hurtful' remarks". CTV.ca. Archived from the original on 2008-06-13. Retrieved 2008-06-12. ^ "PM sends MP Pierre Poilievre to represent Canada at the Conference against Racism, Discrimination and Persecution in Geneva". Archived from the original on 2010-01-14. Retrieved 2009-07-17. ^ a b c "Tory MP under fire for 'tar baby' comment". CTV News. 2009-05-29. Retrieved 2011-05-03. ^ a b Crawford, A (2009-05-29). "No apology". Canadian Broadcasting Corporation. Retrieved 2015-05-29. ^ "After PSAC endorsement of PQ, Poilievre to push for right to opt out of union dues". Archived from the original on 2012-09-11. ^ LEGISinfo. "House Government Bill C-23, An Act to amend the Canada Elections Act and other Acts and to make consequential amendments to certain Acts". Parliament of Canada. Parliament of Canada. Retrieved 9 April 2014. ^ Raj, Althia (25 March 2014). "Jean-Pierre Kingsley: Bill C-23, Fair Elections Act, Shouldn't Pass Commons As Is". HuffingtonPost.ca. Retrieved 9 April 2014. ^ Bergeron-Oliver, Annie (8 April 2014). "Fraser holds her own on Fair Elections Act". iPolitics.ca. Retrieved 9 April 2014. ^ "Don't undermine Elections Canada". NationalPost.com. 11 March 2014. Archived from the original on 11 March 2014. Retrieved 9 April 2014. ^ "'We believe that this Act would prove [to] be deeply damaging for electoral integrity within Canada'". The Globe and Mail. Toronto. 19 March 2014. Retrieved 9 April 2014. ^ "Tory cabinet minister launches astonishing personal attack on elections watchdog Marc Mayrand". NationalPost.com. 8 April 2014. Retrieved 9 April 2014. ^ Chase, Steven. "Ottawa attack: MPs fashioned spears while Harper whisked into closet". www.theglobeandmail.com. Retrieved 24 October 2014. ^ a b Sandor, Alison. "Second chance for Ottawa man with kidney failure". www.cfra.com. Retrieved 4 March 2016. ^ a b McCooey, Paula. "'I am so proud of Canada': Feds OK visit by kidney donor". www.ottawasun.com. Retrieved 10 March 2016.